Hat-tip: thanks to Cycle Action Auckland for this great idea! NB: This is still a work in progress. Got some useful local advice to add to this? Please let us know! Beginner’s ride: South Hagley Park is just a stone’s throw away with a circuit right around the perimeter. Or take a ride around the courts of Sacred Heart School after-hours. First quiet street options: The streets around Church Square are very friendly, e.g. Poulson St, Ward St. East of Selwyn St, you’ll find quiet options on Fairfield Ave, Burke St and Ruskin St. Useful cycleways: The top of Grove Rd has an off-road signalised crossing of Moorhouse Ave into South Hagley Park. The Little River Link cycleway then runs past Church Square and alongside Brougham St and the southern motorway towards Spreydon and Wigram. Great destinations: The quiet streets south of Lincoln Rd lead you straight to the great array of shops and cafes along the main drag; Lincoln Rd itself has cycle lanes to keep you out of trouble. 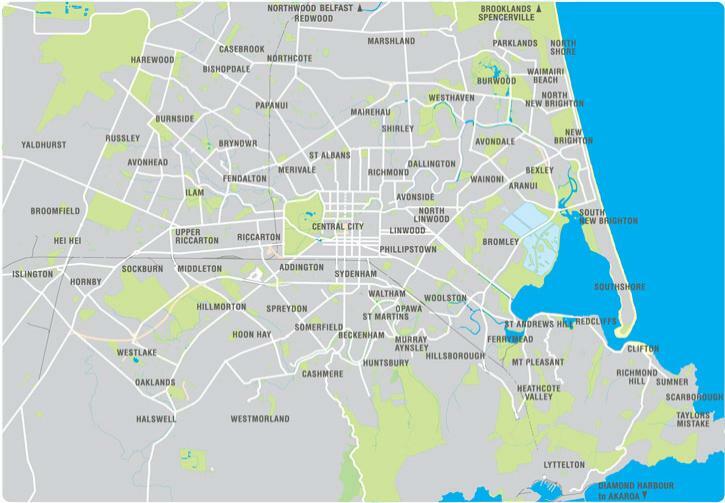 Or from Sth Hagley Park you can easily find your way past the hospital to the Avon River in town. Insider’s Tips: There’s a great pathway connection from Ruskin St up through Burke and Fairfield all the way to Addington Cemetery and Braddon St. Want to get to Tower Junction avoiding Whiteleigh Ave? Try the back way along Clarence St Sth and Leamington St, then ride the pathway alongside Whiteleigh over the railway line. First quiet street options: Away from the boulevards, most local streets are fine to ride on. The busiest are probably Bibiana St and Euphrasie Dr, and even they’re not bad. Useful cycleways: The Little River Link alongside the motorway lets you get all the way from Hornby in the west to Spreydon/Addington in the east; in time it will connect right into town. Halswell Rd is busy, but at least it has cycle lanes all the way. Great destinations: From the A&P Show entrance, follow the cycleway south along Curletts Rd all the way to the Halswell/Hoon Hay shops. Insider’s Tips: From Somerville Cres, you can easily access the Southern Motorway pathway by following the creek under the motorway bridge. There are also lots of cycling shortcuts between streets through the parks and alleyways, e.g. Marcella Reserve, Kinsella Reserve. Beginner’s ride: Bexley Park has some fun paths to ride along. Or try the many paths through Wainoni Park. First quiet street options: Away from Pages and Breezes Rds, most local streets are fine for riding, although Hampshire St can get a bit busy. Great destinations: The Pages Rd cycle lanes will get you to the various sporting facilities at Cuthberts Green and Cowles Stadium. Nga Hau E Wha National Marae is also right next door. Insider’s Tips: Some of the streets around here are still under a lot of reconstruction works, with closures and diversions. Make sure you check out www.tfc.govt.nz first for the latest road info. Beginner’s ride: Hulverstone Reserve by the Avon River offers long scenic rides. Or go for a short ride through Avondale Park. First quiet street options: Avonside Dr and Hulverstone Dr offer quiet riding by the Avon River. Other streets away from Avondale and Breezes Rd are also fairly OK. Useful cycleways: Wainoni and Breezes Rds have cycle lanes along them. And the Avondale Rd bridge has a shared path on one side. Great destinations: Those Wainoni Rd cycle lanes can take you to the new Pak’n’Save (and a neat little play reserve next to it) – there’s also a pathway access in off Shortland St.
Insider’s Tips: The shortcut through Avondale Park between Niven St and Breezes Rd avoids having to use Avondale Rd – good for getting to the local schools and shops. Beginner’s ride: Avonhead Park has a big circuit of paths around it. The western end of Crosbie Park also has some fun BMX tracks to ride over. First quiet street options: Most of the streets west of Avonhead Rd are fairly quiet, other than Maidstone, Withells, and Merrin. Useful cycleways: If you have to use Yaldhurst Rd, it has cycle lanes. Woodbury-Staveley-Parkstone provides a useful quiet but direct route towards Ilam and beyond. Great destinations: Avonhead Shopping Centre can be accessed from the quiet streets to the east via Brookby Cres. Why not check out Riccarton Markets every Sunday at Riccarton Racecourse? Use the signals at Nortons Rd to get over Yaldhurst Rd to Racecourse Rd. Insider’s Tips: There are lots of useful pathway shortcuts between local streets, including through Hyde Park, Cricklewood Reserve, and Ferrier Park. They’re also a handy way to connect to Merrin, Russley, and Avonhead schools. Beginner’s ride: Avon Park and Beverley Park have some nice paths through them. First quiet street options: Following the Avon River along Avonside Dr is even quieter post-quake; most of the connecting streets are too. Useful cycleways: Avonside Dr has cycle lanes towards the city, as does Linwood Ave towards Eastgate, and Woodham Dr towards Gloucester St shops. There’s even some separated cycleways immediately north of the Gayhurst Rd bridge. Great destinations: The Swanns Rd bridge will get you across to the Stanmore Rd shops in Richmond. Insider’s Tips: The Residential Red Zone makes much of this area great for riding, without much traffic. Beginner’s ride: Follow the pathways along the true righthand side of the Heathcote River. Or head for Beckenham Park (and adjacent Beckenham School) to spread out. First quiet street options: Tennyson and Norwood/Birdwood can be a bit busy; the rest are mostly pretty quiet. Useful cycleways: Tennyson St has separated cycleways along its length. Colombo St also has bike or bus/bike lanes all the way down. Great destinations: South Chch Library is just where the Heathcote crosses Colombo St; the adjacent river streets provide and easy way to bike there. Insider’s Tips: There are a number of bridges crossing the Heathcote, some only for walking/biking – get to know your local faves. Beginner’s ride: The Groynes has some great recreational paths. There is also a series of path connections all the way from Shenley Reserve via Belfast School and Sheldon Park through to Castille Reserve. First quiet street options: The local streets between Johns Rd and Main North Rd are fine for riding on. Useful cycleways: The coming highway works to the east and west of Belfast promise some handy pathways as part of them. For now there are fairly slim pickings along the main routes. Great destinations: The Darroch Reserve links to a recreational loop route right around back to The Groynes (although you’ll have to watch the current Western Bypass works) – access off Darroch St. Further south, the Northwood Supa Centre is best accessed from the north by coming down through Northwood and then across the Northwood Boulevard signals. Insider’s Tips: Heading further north via Main North Rd is tricky at the motorway entrance; it’s probably easier to use Belfast or Factory Rds to get to Guthries Rd and onto Marshland Rd. First quiet street options: ? Beginner’s ride: Not too far away are the bike tracks around Nepal Reserve and Kendal Reserve. First quiet street options: There are lots of quiet street options around Grant Armstrong Park, with various connecting pathways between streets too. Useful cycleways: Cycle lanes on Greers Rd get you between Harewood Rd and Northcote Rd. There’s also handy islands to get you across the Harewood roundabout between Bishopdale shops and Highsted Rd. Great destinations: Bishopdale School can be accessed from the surrounding quiet streets via the pathways connecting to Reynolds Ave through Tralee Reserve. The Bishopdale shops and adjacent park and recreation centre are easily accessible from all directions, especially through the quieter streets to the south and west. Insider’s Tips: To avoid going through the Harewood Roundabout from the east, use the carpark at the vets just west of Greers Rd to get to the quieter Eastling St.
Beginner’s ride: It’s hard to go past the fantastic Westburn Reserve cycle training park, between Westburn Tce and Memorial Ave; a very popular place for the young’uns. But the skills track at Kendal Reserve is also worth a look. First quiet street options: Lots of quiet options between Memorial Ave and Wairakei Rd, including connecting through the many pathways of Nepal Reserve. 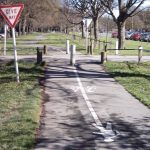 Useful cycleways: The Burnside cycleway connects via paths and quiet streets all the way from Fendalton School (Clyde Rd), past Cobham Intermediate and Burnside Primary, through Jellie Park, along the back of Burnside High, past the Kendal Ave shops, to the William Pickering Drive industrial park. It’s a bit tricky to follow the route though. Great destinations: Jellie Park and Pool is easily accessed from eats and west via the Burnside cycleway. Burnside Park also provides many sport options and has good path connections to the north and south. Insider’s Tips: The Memorial/Greers intersection features NZ’s first ever “hook turn”, which allows you to turn right across the multi-lane road by a two-step manoeuvre of keeping to the left. Beginner’s ride: Hagley Park has great riding options all around and through its extents. Washington Way Skate Park could also be fun to test your skills on. First quiet street options: Many parts of the Avon River corridor are very friendly (and getting better with CERA’s works). Useful cycleways: Tuam St now boasts an eastbound separated cycleway, with a westbound on St Asaph to come. Colombo St south of the Square has some raised cycleways and will in future host even better cycling facilities to the north. Great destinations: The whole central city has great destinations to choose from, such as RE-Start Mall. The new Bus Interchange is also easily accessed via the cycleways on Tuam and Colombo. Insider’s Tips: Need a bike for you or friends to get around the central city? Rent a “Spark Bike” at one of the five stations around the CBD – your first half hour is always free! Beginner’s ride: There are some paths in St Albans Park (Edward Ave/Madras St) that would be suitable for newbies. Abberley Park (Abberley Cres) is another handy option. First quiet street options: The streets north of Bealey Ave such as Champion, Packe, Geraldine and Bishop are quiet streets for north/south travel. Canon and Purchas streets provide quiet east/west travel. Useful cycleways: No separated cycleways as yet (Papanui Parallel is coming). Manchester Street has painted lines for cycle use. Great destinations: Abberley and St Albans Parks are great recreational options. The Edgeware shops are also handy at the top of Colombo St.
Insider’s Tips: If riding east/west during off peak times Canon and Purchas streets are great, but will require giving way to north/south traffic at all intersections. Despite Trafalgar Street having speed humps, traffic moves swiftly along it and with parked cars there may not be room for overtaking a cycle = frustration. Beginner’s ride: Fendalton Park is a good place for a beginners’ ride. The Railway Cycleway also provides a nice traffic-free environment. First quiet street options: Most of the back streets off Fendalton Rd are very cycle friendly, including calming to slow traffic down. And there are signalised crossings of Fendalton Rd at the Railway and near Snowden Rd. Useful cycleways: Kotare St/Kahu Rd and Straven Rd have cycle lanes along them (some with with separator posts). The Uni-Cycle route goes along Matai St, then behind Boys High and through Riccarton Bush towards Ilam. Great destinations: Mona Vale Homestead should hopefully be reopened by mid-2016; easy to get to via the Railway Cycleway and Uni-Cycle route. The new Uni-Cycle crossing at Matai & Deans also provides an easy way to get into Hagley Park. Insider’s Tips: Along Fendalton Rd there are handy bypasses behind the bus stops if you are riding along the cycle lanes and a bus is parked there. From the top of Harakeke St there are useful path links through to Fendalton Rd and Straven Rd (Royds St) too. Beginner’s ride: The Charlesworth Reserve has some great pathways to wander around. Across the river at Ferrymead Sports Park (Ferrymead Park Dr) you’ll also find some interesting paths to explore and a pump track. First quiet street options: All the local streets in Charlesworth are quiet and friendly to cycle on. Useful cycleways: The Coastal Pathway now extends all the way from Ferrymead to Redcliffs via an off-road path – why not make a trip of it? Ferry Rd and Humphreys Dr also have cycle lanes into town. Great destinations: The scenic Heathcote Towpath pathway runs along the northern side of the Heathcote River before reaching the Ferrymead bridge – watch some of the sharp corners though. The Ferrymead shopping centre is reasonably accessible via the adjacent cycle-laned roads. Insider’s Tips: It is possible to get into the back of the Ferrymead shopping centre (behind Mitre 10 Mega) from the Charlesworth Reserve, but they don’t make it obvious or easy. Same goes for accessing the Reserve via Humphreys Dr – you’ll have to go over a fence. Beginner’s ride: Halswell Quarry has some nice recreational trails. There’s also some nice pathways running along the green spaces in Halswell On The Park between William Brittan Ave and Milns Rd. And now there’s a new kids cycle skills park in Knights Stream. First quiet street options: There are lots of quiet culs de sac and accessways throughout Halswell On The Park for riding around. Useful cycleways: Halswell Rd has cycle lanes along its length if you need to get into town. Great destinations: Halswell Domain and Aquatic Centre can be accessed from either cycle lanes on Halswell Rd or the back streets via Edward Stafford Ave. Halswell Quarry Park is also a great place for picnics and scenic walks – head out there via Kennedys Bush Rd. Insider’s Tips: It is possible to get into the Halswell Shopping Centre through the gate in the back at the end of Rearsby Dr.
Beginner’s ride: Hoon Hay Park has a skate/bike park so you can ride up and down the banks and practise riding on various contours. Totally fun for newbies and kids (of all ages). First quiet street options: The streets between Mathers, Hoon Hay and Sparks Rd are all fairly quiet routes, e.g. Victors Rd. Likewise with the various streets off Rowley Ave. Useful cycleways: Hoon Hay Rd has on-road bike lanes all the way from Halswell Rd to Mathers Rd. Halswell Rd also has bike lanes along its length. Great destinations: From the Haslwell/Hoon Hay intersection, there is a nice undulating separated bike path to connect you to the A&P Showgrounds and alongside the Southern Motorway towards Wigram, Aidanfield and Hornby. Insider’s Tips: There are lots of useful shortcuts, e.g. Victors Rd through Hoon Hay Park to Mathers Road and McCarthy St (via grass by stream), and various other alleyways connecting smaller streets. Off Hoon Hay Road there are also path crossings east over Heathcote River near Mathers Rd and via Smartlea St.
Beginner’s ride: Centaurus Park and neighbouring St Martins School provide a safe riding environment. And not too far away is the Heathcote River and Hansen Park. First quiet street options: Most streets away from Centaurus are pretty quiet, although some can be a bit hilly. On the flat, the streets around Albert and Hillsborough Terraces are fairly friendly. Useful cycleways: Centaurus Rd and Wilsons Rd have some cycle lanes. And there are quiet streets and pathways all along the Heathcote River. Great destinations: The Rapaki Track is probably the easiest way to bike up to the top of the Port Hills, with some great views along the way. And at the end, a cuppa at the bike-friendly Fava Cafe (by Wilsons/Centaurus roundabout) is well worth it. Insider’s Tips: The upper end of Vernon Tce links through to Heybridge Ln and Hillsborough Tce via an alleyway. On the hills, most of the connections between streets involve steps, so not as easy with a bike. Beginner’s ride: Ray Blank Park has some nice pathways to ride on. Out of teaching hours, the University campus also has lots of quiet paths to explore. First quiet street options: The local streets immediately south of University, either side of Ilam Rd, are quiet and traffic calmed. Useful cycleways: Ilam Rd has a separated cycleway along it through the university precinct, part of the Nor’west Arc. The Uni-Cycle route links Dovedale campus with town via the University and Riccarton. Creyke/Maidstone Rds and Clyde Rds also have cycle lanes along them. Great destinations: The Ilam Gardens and Homestead are well worth exploring; get there via Ilam Rd or Homestead Ln. The back streets between Ilam and Waimairi Rds allow you to safely get yourself to the Bush Inn shops. Insider’s Tips: There’s a cut-through between Barlow St and Coldstream Court that is good to get through between Creyke Rd and Memorial Ave. There are many useful shortcuts through the University campus too, e.g. on the north side of Ilam Fields (the signalised crossing at Dovedale also makes it easy to get across Waimairi Rd too). Beginner’s ride: Linwood Park has a series of paths around it. And it connects to the Linwood Drain path that extends all the way to Hargood St.
First quiet street options: Most local streets either side of Linwood Ave are quiet (Gloucester, Hereford and Smith Sts are busier). Useful cycleways: The Rapanui/Shag Rock cycleway will take you all the way from town (Fitzgerald Ave) to Linwood Park via the Stanmore Rd shops (and soon further towards Bromley and Ferrymead). Cycle lanes are available to help you along Linwood Ave and Buckleys Rd. Great destinations: Eastgate Mall is handily accessed from the south via the signalised crossing at Chelsea St, and via the quiet local streets to the north. Insider’s Tips: At the Buckleys/Russell intersection you can bypass the signals when heading northeast by using the off-road path. Want to try something different? Try riding down the middle of the grass median of Linwood Ave. Well away from traffic while being in the middle of it! Beginner’s ride: Head over to Westlake Reserve to access lots of paths around the lake. Or go over and explore Halswell Domain. First quiet street options: Most streets away from Halswell Rd are relatively quiet. Great destinations: Wales St and Oakridge St are an easy way to get to the Halswell Shops on Nicholls Rd. Then use the crossing refuge to get across SH75 to visit the Te Hapua swimming pool and library. Insider’s Tips: The paths through Wales Reserve and Scott Park provide an easy way to get from Patterson Tce towards Oaklands School while avoiding Wales St. Useful cycleways: The Papanui Parallel connects the railway line and Northlands with St Alban and the city. The Northern Line also runs along the railway corridor, connecting Redwood, Bryndwr, Fendalton and Riccarton. Beginner’s ride: The Coastal Pathway now provides an off-road route all the way to Ferrymead. First quiet street options: Beachville Rd and Celia St by the waterfront are never very busy. And on the other side of Main Rd, most streets into the hills are also quiet for riding (Cave Tce and Glenstrae Rd are a bit busier). Useful cycleways: Main Road has cycle lanes all the way along it from Sumner to Ferrymead. And of course the Coastal Pathway is slowly extending further over time. Great destinations: Ride west along the Coastal Pathway to go and explore the estuary or shops at Ferrymead. Closer to home, head over to Barnett Park for a scenic walk up the valley; cycle lanes on Main Rd will take you there. Insider’s Tips: Beachville Rd provides a handy back way into the Redcliffs shops, especially while the containers have narrowed Main Rd east of McCormacks Bay. Beginner’s ride: The Railway Cycleway provides a great off-road route all the way from Kilmarnock St to Papanui and Northcote. Not too far away also is Hagley Park with its many paths. First quiet street options: Most local streets between Riccarton Rd and Blenheim Rd are fairly quiet, but take care crossing the north-south roads like Clarence and Matipo. Useful cycleways: The Uni-Cycle route along Matai St provides an easy connection from Hagley Park through to University. If you need to brave Blenheim Rd, at least it has cycle lanes along it, althouh Peverel-Lochee provides a quieter east-west route. Great destinations: Riccarton Bush is a very pleasant place to while away some hours (with a Saturday market outside Riccarton House); get there via the quiet streets to the west and south or the Uni-Cycle route. Insider’s Tips: A cycle-only crossing on Dilworth St at Clarence St allows you to get from Picton Ave over towards Westfield Mall. From Riccarton Rd by the railway line there’s also a handy little pathway that connects to the back of Brockworth Pl and onto Sth Hagley Park. Or further down at the Blenheim/Mandeville intersection, another pathway leads across the railway line to a signalised crossing into Sth Hagley Park. Beginner’s ride: Avonhead Park has a great network of paths around it. Burnside Park also has lots of space for riding. First quiet street options: Most of the streets west of Withells Rd are quiet; Apsley, Cutts and Woodbury are the busiest. Useful cycleways: If you have to brave SH1 Russley Rd, at least it has cycle lanes all the way along it. Great destinations: The airport is growing into an interesting destination in its own right with the opening of Spitfire Square shops – or you could just plane-watch. Getting across SH1 is a bit tricky at the moment, but will be much improved when the new Memorial Ave flyover and signals go in. Insider’s Tips: If you work at the Airport Business Park on Russley Rd, you can bike there the back way via the pedestrian entrance on Fenhall St. There’s also a handy link from Avonhead Rd to Memorial Ave through the Commodore Airport Hotel. Beginner’s ride: Abberley and St Albans Parks are good for new riders. Malvern Park has a grassed area that may also be suitable. First quiet street options: The streets south of Innes Rd and between Cranford St and Papanui Rd right down to Bealey Ave are generally quiet streets off peak, with the exception of Rutland St, St Albans St and Springfield Rd. Useful cycleways: The Papanui Parallel Cycleway passes through St Albans linking Papanui and Northlands to the central city via Edgeware village. Insider’s Tips: Bristol St is useful to ride if Papanui Rd feels busy. Colombo St is probably the best route to ride into the central city. From St Albans to Hagley Park avoiding the pinch point at Carlton Mill Corner, try Bristol St, Webb St, (use pedestrian refuge to cross Papanui Rd) then Merivale Ln to Rossall St, left-right into Holmwood Rd, and take first left into Helmores Ln towards Harper Ave. Useful cycleways: Both St Martins Rd and Wilsons Rd have cycle lanes for most of their length. The Heathcote River also provides a handy cycling route. Great destinations: The St Martins New World supermarket and other shops are easily reached from any direction. Immediately north of the river on Wilsons Rd you’ll also find Waltham Park with swimming pool, skatepark bowl and playground. Insider’s Tips: There’s an easy-to-miss pathway linking Clouston St and Gamblins Rd past the bowling and croquet clubs. Take care at the roundabouts in the neighbourhood; taking the lane is your best bet for a safe outcome. Beginner’s ride: Somerfield Park has lots of space to stretch out. Not too far away are the Heathcote River paths and Centennial Park too. First quiet street options: Ashgrove Tce by the river is a pleasant ride and connects to many other adjacent quiet streets. Useful cycleways: Somerfield and Barrington Sts have cycle lanes along them. There’s also a handy quiet route connecting south of the river to Barrington Mall via Studholme St, Somerfield Park and Simeon St.
Great destinations: Any of the east-west quiet streets of Roberta, Conway, Stanbury and Rose can get you to Centennial Park and Pioneer Stadium/Pool. Insider’s Tips: A lot of the local schools and parks can be accessed by the quiet streets away from Barrington, Milton, Selwyn, and Somerfield. Beginner’s ride: The Esplanade along Scarborough Park provides a wide traffic-free path to ride on (can be busy on a nice day though). First quiet street options: Most streets in the Sumner valley, except for Wakefield Ave and Nayland St, are very quiet. Useful cycleways: Main Rd from Redcliffs has cycle lanes, although currently there are a few pinch-points due to the containers – traffic is pretty good about letting you in though. Great destinations: The eastern end of Scarborough Park, with playground, pool and cafe is a great place for the family; easy to get to from any direction. If you’d like to challenge yourself and get rewarded with a great view, take a ride up Evans Pass Rd. Insider’s Tips: On the beachfront path just west of Cave Rock, a bike repair stand has all the tools to let you make any minor tune-ups to your bike.If you want to make your way towards Redcliffs off-road, a narrow path is available along the coastline until you are past the narrow Shag Rock corner. Beginner’s ride: Both Middleton Park and Upper Riccarton Domain have some nice paths to ride on. The University of Canterbury campus is also a pleasant place for a ride, especially on the weekend. First quiet street options: Most local streets between Riccarton and Blenheim Rds are quiet; just be careful crossing the north-south routes like Hansons and Middleton. Useful cycleways: Suva St connects the area with central Riccarton via Middleton Park, Lochee Rd and Peverel St. Cycle lanes can be found on the main routes of Peer St, Hansons Ln, Main South Rd, and Blenheim Rd. Great destinations: The Bush Inn is surrounded by traffic-calmed streets to the north; easy to ride to. The Upper Riccarton library is another great destination; use the Main South Rd cycle lanes to get there. Insider’s Tips: At the Blenheim/Hansens/Annex intersections you can stay off road by using the shared path on the south side. Beginner’s ride: Westlake Reserve has heaps of pathways to tootle around on. There are also some nice pathways in the new subdivision of Longhurst to the west. First quiet street options: Most local streets between Dunbars and Halswell Junction are relatively quiet. Near-neighbours Aidanfield and Longhurst also feature lots of nice calmed streets. Useful cycleways: Just over the Awatea Rd overbridge you can connect to the Little River Link major cycleway, which takes you right into town. Great destinations: Why not use the Little River Link to connect to Wigram Skies and try out the cafes at The Landing? Insider’s Tips: There are a number of small reserves that provide handy shortcuts between local streets, including Vanderbilt Reserve, Ridder Reserve, and Campion Reserve. Don’t see your suburb? Suggest a new area to us and (even better) provide us with some of the info! First quiet street options: Most of the residential streets that run east/west between the major north/south arteries. Useful cycleways: Sadly not much in Spreydon itself (only short routes through Barrington Park, Sydenham Cemetery/Somerfield Park) but Collins Street/Grove Road, the Heathcote River shared path, and Tennyson Street aren’t far away. Great destinations: Zeroes Café (for real cyclists! ), Pioneer Stadium, or pop to the shops at Barrington Mall. Insider’s Tips: I’ve only just started cycling so can’t really give you much info! Erm… there are lots of bike shops!